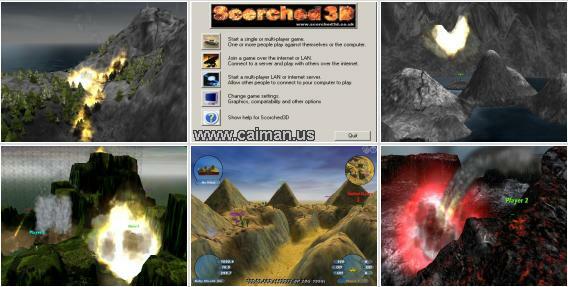 A great 3D Sorched Earth with amazing graphics, single and multiplayer over LAN and internet. 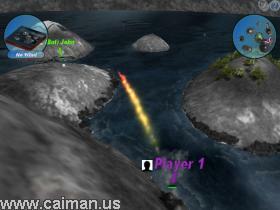 A Sorched Earth game is an artillery game whereby you have to aim your cannon and blast the enemies cannons away. Thus choose the angle, direction and power of each shot, launch your weapon, and try to blow up other tanks. But Scorched3D has much more options. You can earn money from successful battles and use it to invest in additional weapons and accessories (all kind of missiles, shield, etc... I personally love the napalm the most). You can play with up to twenty four other players at a time, mixing computer players with humans. There's a variety of changing environmental conditions and terrains to be dealt with. 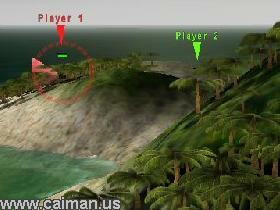 A = aim at the position on the landscape pointed to by the mouse pointer. Look at the documentation included in the game for more keys. If you like Scorched Earth games, go to the "Authors homepage" and enjoy this top game! Authors Download page (Windows, Linux, MacOS, FreeBSD etc - install) 48 MB.